2. ENTR'ACTE "NO MORE ROAMING"
4. 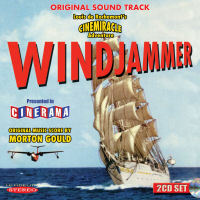 Conductor JACK SHAINDLIN working with Orchestra on the "OVERTURE"
"Windjammer", a 1958 film that recorded a 32,400 km voyage of the Norwegian sail ship "Christian Radich" from Oslo to the Americas and the Caribbean was the only film to be shot in the widescreen Cinemiracle process, which came with a seven-track stereophonic soundtrack composed by Morton Gould. The film sound track was never issued at the time and only a studio assembled LP was made available. We have remastered the sound track from the original tapes are delighted to be releasing the music on 2 CDs which also includes music from the studio LP.